Vicki and I were pawn brokers together in Texas - I think I can speak for both of us when I say that it was the most interesting job ever, right Vic? She is a total goofball, as you can see in the photo. Her and I were so excited when we got to purchase these two scooters at the pawn shop. 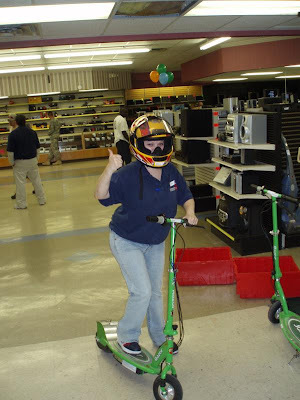 We rode around the store that day like kids - Vic has always brought out the crazy in me. I love you and miss you, Vic (email me your address so I can ship your bag). I wanted all of you to win a bag (I wish I had more to give away!). But honestly, I was pleased when the random number generator chose Vicki's number - because I know how much she'll love having it. I always hate entering giveaways because I never win anything. But if you're one of those who didn't win this time, don't worry - there will be more in the future! Thanks for all of your comments and support! Awwwww, Yaaaaaaay! I’m a WINNER!! You got me feeling all special and stuff Erin.. First I would like to Thank God, My Family, My Friends, Erin of course oh and most of all My Fans... The fans, without you guys it wouldn’t of been possible… LOL. Nah, just kidding, for real.. Yes the pawn business was and will always be crazy, but no one will do it up like us guys at good ol' Action Pawn #1... We used to have soooo Much FUN... Erin, you and your little family are amazing and I am going to find away some day, some how to come up there to visit you guys.. I want to kiss up Mr. Tucker... I mean that is if you’ll have me and my kids up, I also want to see that there house your working with.. I just no I’ll cry when I walk in due to its PROFOUND BEAUTY... Thanks For doing this giveaway, I’m one of them that don’t usually win, so this is super duper exciting for me... Yay for Vicki!!! (Hey I think I might hit up B.I.N.G.O, since I’m on a roll and all, LOL) also keep up the good work Erin, you are so creative and artistic you are deemed for greatness, although I think you are already oh so freaking super duper GREAT! Love You and Miss You Too and yes I will totally enjoy this beautiful masterpiece of yours…(You will see pictures of me with it) I don’t even have it yet and I feel so (what are the words?) Grateful, and Honored to knowing that I’m going to be having such a pretty piece of LOVE of Erin’s heart and soul... Well anyway my book/speech is done.. I’m super excited Erin…(Last name not to be disclosed at this time) LOL….